Why Girl Scouts? Why not sports or music or dance or a nice nap on the couch after school? In Girl Scouting you have common values, found in the Girl Scout Promise and Law. Lots of organizations have value systems, but ours is inclusive of any girl who wants to join regardless of her talent, skills, ability to pay or her own faith or cultural heritage. Girls Scouts have the Girl Scout Leadership Experience where they Discover, Connect and Take Action. Our Journey curriculums allow girls to forge their paths through relationships, our environment and storytelling. Badges and awards teach girls practical skills and allow them to reach high and try things that they have not tried before. The Bronze, Silver and Gold Awards demonstrate a girl's skills, perseverance and commitment to making the world a better place. This is where leadership develops and grows. 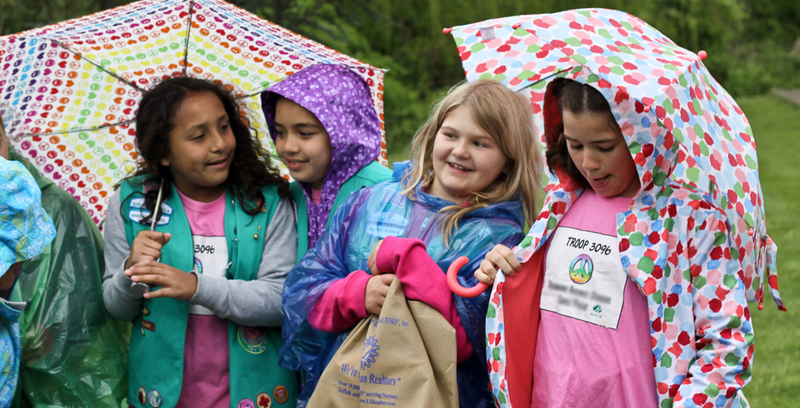 Girl Scouts have access to camping and other outdoor opportunities. They can focus on science or music or community service - or all three! The list of activities available to girls is almost as big as their imaginations. If there is something that girls want to know or do, you can bet that a Girl Scout somewhere has explored that option. From horseback riding to Space Camp, robotics to Broadway, Camp CEO to sing-a-longs – the sky is the limit! Girl Scouts learn and earn. Through the Girl Scout Entrepreneurial Programs every girl has the chance to build skills in goal setting, decision making, money management, working with people and business ethics. These skills will empower them in school, in work and in their families for many years to come. The Girl Scout Cookie Program makes it possible for every girl to be part of the fun regardless of her family's financial resources. No one is ever turned away from Girl Scouts! Values, skills and financial sufficiency are important to parents and girls. But, according to our Girl Scouts, what means the most to them is the FUN and friendships that they make. Yes, they are learning, earning, growing, leading AND having FUN! So please, join us! When it comes to bullying - power, authority, and leadership are very different. In response to the now viral video of bus monitor Karen Klein being tormented by students on the bus, many have criticized the students for having no respect for authority. They did however, have too much respect for power. There is one student who leads the torments in the video. He calls her names, threatens her, makes inappropriate physical contact, and revels in the adoration each cruel act receives from his peers. The other students join in, attempting to share some of his power. Throughout the video, we hope for Ms. Klein to take back her power. We want her to stop the bus or call for assistance, but she never does. As the adult, she is the natural authority figure in this situation. However, like many other targets of bullying, she appears powerless. This is one of the biggest tolls of bullying, that it strips targets and bystanders of their confidence. Even though they are taught that bullying is not their fault, it is hard not to take the insults to heart. Girl Scouting teaches girls to have courage, confidence, and character even in the toughest of situations, like this bullying incident. Girls are empowered with the understanding that leadership is not just about power or authority. As defined in the Girl Scout Leadership Experience, true leadership is about discovering yourself, connecting with others, and taking action to make the world a better place. In regards to bullying, leadership is about discovering the personal qualities that can help us overcome it, connecting with others who can support us, and taking action when we see it happen. In the case of the bus bully, the world connected with Ms. Klein and took action. She has received letters and donations in support of her experience. The school is taking action by investigating the incident. Let’s hope the students are reflecting to discover on why they acted or inacted that way in the first place. Update: The boys who bullied Ms. Klein were punished by a one-year suspension from school and instead will have to attend an alternative school, participate in a bully-prevention program, and do community service for senior citizens. Ms. Klein said she is happy with the sentence. After receiving over $600,000 in donations she is not yet sure whether she will return to work next year.